Toms parents came for Miller’s baptism his mom and Will had dinner with us in Saturday night. 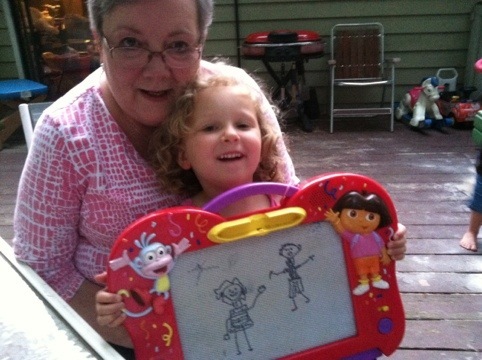 Mamaw and Faith drew together for a long time. Below is a picture of the two of them and their artistic work. Tom’s dad stayed with us this week. I think Faith was glued to his side for the first 24 hours. It was really cute. She helped him unpack, fix things, and played games. 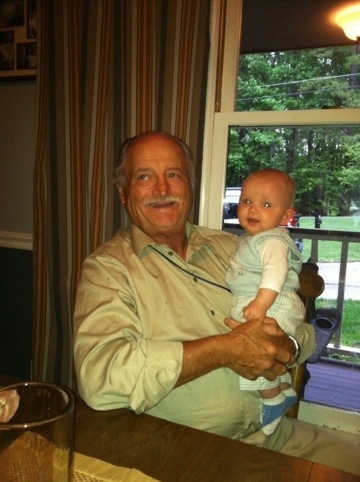 It amazes me the immediate and unconditional love that exists between kids and grandparents. Kids just know that they are loved by grandparents and they reciprocate that love. Grandpa was a big help. He fixed lights, babysat the kids, and went to Walmart to buy dinner. Of course he brought Faith with him to the store. I even got a two hour nap one day! Thanks Grandpa! This entry was posted in Uncategorized on April 29, 2012 by Becca. 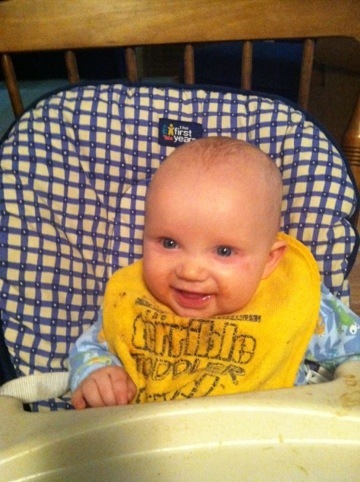 Miller has officially begun to eat baby food. So far he has had apples, peas, bananas, and prunes. He isn’t a big fan of peas, but who is. Even have him sporting the Steeler bib. He loves it. It is almost like he knows he is doing something new and big. The doctor said that they now recommend that babies skip the rice cereal and go straight to the good stuff. It is interesting because both of my other kids would spit out the cereal. I thought it was because they had to learn how to eat real food. Nope, they spit it out because it tastes bad. Miller is gobbling up the veggies with no problem. Who knew! If only babies could talk. This entry was posted in Uncategorized on April 28, 2012 by Becca. Faith had her appointment yesterday to get the final two, of eight, cavities filled. It has been quite the ordeal. I took her to the dentist about six months ago and the dentist told me that she had a cavity in every tooth. I couldn’t believe it. I suspected that she might have a few, but not twenty. It was partly mine and Tom’s fault and part genetics. We were not diligent in making her brush and floss every night. I have a feeling she may have soft teeth as well. Needless to say, we floss and brush every night now. 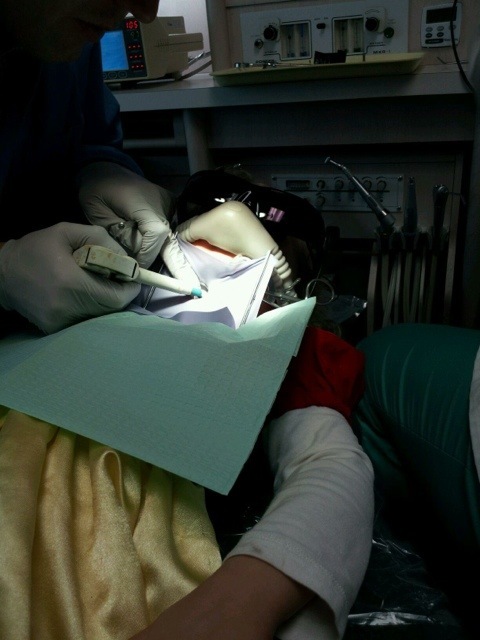 So, the first dentist wanted to take Faith to the hospital, put her under and fix every tooth. This was going to cost us more than $5000. Ridiculous! I started calling around to other dentists and trying to find someone who would give her nitrous and try to fix a few at a time. We found Dr. Kibbler who said that he would fix two at a time without nitrous. He was fantastic! He fixed four cavities in two trips. The third trip, however, didn’t go so well. Faith screamed and cried the whole time. You would have thought that she was getting her leg cut off back there. I decided that after that experience we needed some drugs to get the others done. I felt bad leaving Dr. Kibbler because he was great, but Faith was not going to do well again, I was sure. I then went to see Laxer, Long and Savage. They were so encouraging and kind. They took x-rays of her teeth and told me that there were only 3 more cavities that they would need to fix. That put us at a total of eight fillings…not twenty! What was the first guy thinking? Anyway, we tried nitrous and got one filling done. Then yesterday we went in and they gave her an oral setative and nitrous and we finally got the last two cavitities filled! Finally! We were done! I took Faith to the store after her trip to get her a prize. She was hilarious!! She was still a little loopy from the drugs. She was touching everything in the store and saying, “Ooohh, that is so pretty.” She went up to the jewelry counter and tried to look closely at the diamond rings but her depth perception was a little off. She leaned in and bumped her head into the glass. She just giggled. We had a fun time at the store. She ended up choosing to buy new shiny pink flip flops and a pair of sunglasses. 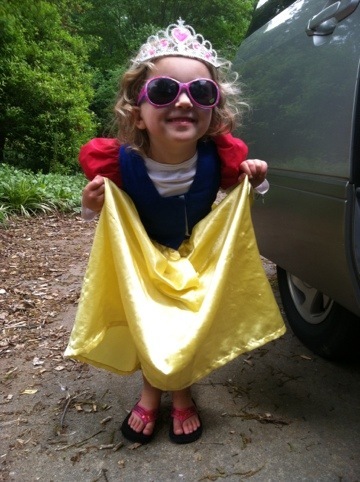 (She already had on the Snow White dress). She definitely drew some attention at the store. I am so glad that I didn’t go with the first dentist’s plans. It would have cost us a fortune and Faith would have had work done on her mouth that wasn’t necessary. The eight teeth that were fixed were molars and canines. The little teeth up front she will be loosing in the next few years anyway. As a parent, I have learned that it is so important to get a second opinion and to go with what you think to be right. You are your child’s best advocate. Doctors may have their opinions and plans but you are the one to make the final decision when it comes to your child’s welfare. It took me many phone calls and dentist visits, but the path that we took was worth it. I found two great dentists that were willing to listen to what I wanted and needed them to do. Thanks Dr. Kibbler and Dr. Savage! This entry was posted in Uncategorized on April 24, 2012 by Becca. to raise them the love the Lord. That is what we did today. We did it in front of our church, family and friends. Tom’s parents were there, Alan, Betty, laura, John, my parents, Doug and Jaqueline, Sandra and Robert, and Grandma Madeline. It was a time to celebrate and worship together. We sang “Jesus Messiah” which is a family favorite and a song they sang the day Wilson was baptized too. 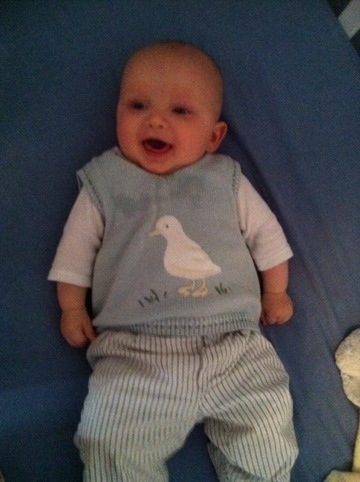 Miller was so cute in his new outfit too. He turned five months old yesterday. He is the sweetest, cutest and most easy going baby. We all love home very much. This entry was posted in Uncategorized on April 22, 2012 by Becca. Found this snake slithering through my living room today! A friend saw it first and screamed “snake!”. I wasn’t sure what kind it was but I was sure that it wasn’t allowed to move in with us…good or bad. I told my friend to not let it out of her sight while I ran to get the shovel. I took two wacks at it with the shovel and it was a goner! I have to say that this experience was a first in my life. I guess I can cross “killing a snake in my living room” off my Bucket List! It turns out that it was a brown King snake. If it had been a black king snake I would have let it live, only because then I would have known exactly what kind it was. The only kind of brown snake I know of is a Copperhead. I didn’t think it was one, but wasn’t going to take any chances. After the excitement wore off, I sat down and thanked God that it happened when and how it did. I am thankful that Paige saw the snake when she did or it may have been found by the kids another day . I am thankful that none of the kids were around when it came slithering through. I am very thankful that Miller wasn’t laying on the floor at the time and I am very, very thankful that it wasn’t poisonous! God’s timing is always perfect…. Ps. I have been told that the picture is deceiving. 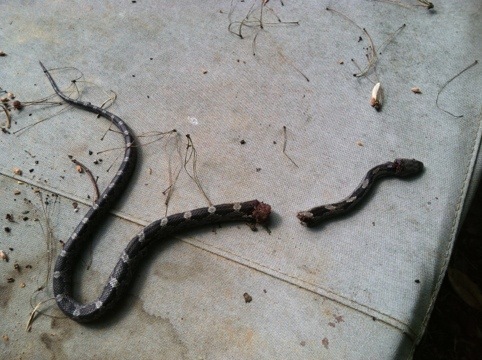 The snake was only 18 inches long….but a snake non the less! This entry was posted in Uncategorized on April 17, 2012 by Becca. 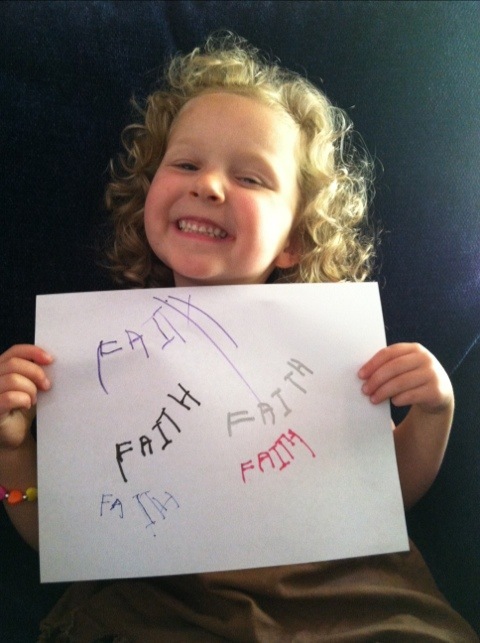 Faith has been practicing writing her name. She is doing a great job. Today we practiced using different colored markers. Makes it fun for her. I have decided to keep Faith home from school next year and try my hand at homeschooling. At her age it is just teaching her little by little and making it fun. She loves to learn and have special time with Mommy while she does her “school work” and little workbooks. It is fun for both of us. This entry was posted in Uncategorized on April 15, 2012 by Becca. Faith went to a birthday party today and put on her party best. It wasnt a themed party at all. 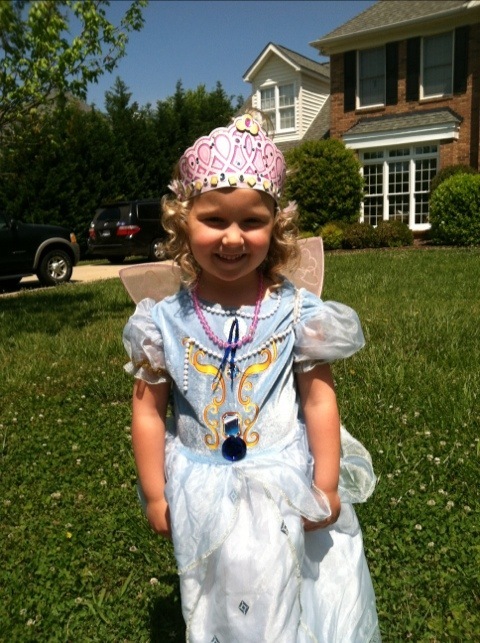 She believes that she looks her best when she is dressed up as a princess. Today she was a fairy princess and couldn’t leave the house without first finding her crown. She is adorable and is always a Cinderella. This entry was posted in Uncategorized on April 14, 2012 by Becca.